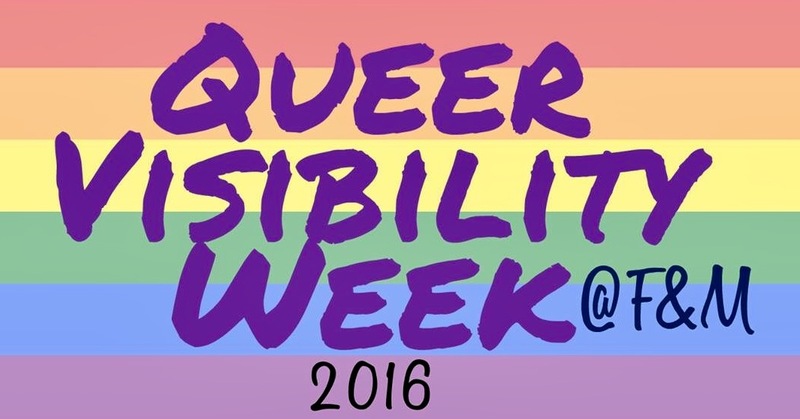 This week a historic event is coming to Franklin & Marshall – the college’s first ever Queer Visibility Week. The Sexuality and Gender Alliance has partnered with the Diplomatic Congress in conjunction with the Office of Multicultural Affairs, the Writer’s House, and the Alice Drum Women’s Center to provide a full slate of events related to queer activism and awareness surrounding queer issues. The programming begins on Saturday, October 22 at 11 a.m. in the Writer’s House with an Opening Brunch to celebrate the week’s commencement. On Monday, October 24 at 7 p.m. there will be a lecture titled “The B-Side: Gay Rights After Gay Marriage” by Dr. Suzanna Walters in Stahr Auditorium. Tuesday, October 25 will celebrate the reopening of the Allies Resource Center with a ceremony at 7 p.m. on the ground floor of College Center. The final event of the week will be on Wednesday, October 26 with a discussion on “Queer Life & Meaning: Blessing and Challenges of Coming Out” in the reading room of the Writer’s House from 5:30-6:30 p.m. Throughout the week, students are encouraged to sign a pledge of support in the atrium of College Center. The event came to be after Diplomatic Congress President Wyatt Behringer approached the Sexuality and Gender Alliance organization about putting on an event for National Coming Out Day, which is held every year on October 11, but quickly realized F&M students were on fall break at the time. “We decided, ‘Let’s do a whole week of things after we get back, because October is actually LGBT History Month’ and that’s where the project was born,” says Behringer. He says the executive boards of both the Diplomatic Congress and SAGA have been working “relentlessly” to put together an interesting and varied collection of events in partnership with spaces and groups across campus that will raise awareness about LGBT activism. The organizers of Queer Visibility Week aim to put LGBT issues in the spotlight through the week’s programming. “I think that this week is important because our LGBT+ community [at Franklin & Marshall] has historically not had much visibility,” says SAGA co-chair Ethan Crans. “It means a lot to prospective students, to students who are closeted, and to students who are out to see this whole campus coming together and affirming support for LGBT issues.” Though gay marriage was notably made legal throughout the United States in the Supreme Court’s landmark Obergefell v. Hodges decision in June 2015, queer activists point out that marriage is just one facet of life. Gender and sexuality remain important and complicated factors impacting countless segments of public and private life. SAGA and the Diplomatic Congress hope to raise awareness and boost levels of support for a wide variety of queer issues that impact students at Franklin & Marshall. “Especially after Day of Dialogue, we as a club realized that people want to be involved with us,” says SAGA co-president Lee Scaralia of the logic behind putting on Queer Visibility Week. “We want to be receptive to that… We want to give people a space to show their support.” Members of SAGA and the Diplomatic Congress are additionally making a push for the executive boards of other campus clubs to raise related LGBT topics up in their own meetings. Queer Visibility Week will come and go, but everyone involved in putting it together hopes the discussion and increased awareness of queer issues remains. Saga co-chair Ethan Crans stresses that SAGA can only have one weekly meeting in a space of limited size, but LGBT issues are broad, varied, and require in-depth dialogue to produce change. “There are so many levels at which discomfort or discrimination are possible, and we are really trying to work with all of them.” This is a big job, and those involved in putting Queer Visibility Week together hope that this is only the beginning. The goal for SAGA and the Diplomatic Congress is to have Queer Visibility Week become an annual event, 2016 being the first of many years where queer issues are brought to the forefront. For now, they are focused on encouraging their fellow students, regardless of sexuality or gender orientation, to express their support for queer activism and participate in what Queer Visibility Week has to offer. The Diplomatic Congress is Franklin & Marshall’s student-run governing body. They convene every Thursday night from 6-7 p.m. in LSP and put on a wide variety of programming throughout the academic year. SAGA, the Sexual and Gender Alliance, meets every Tuesday night at 8 PM in the Allied Resource Center in the ground floor of College Center. One of their biggest events open to all students, the annual Gender Bender Ball, will be held later this semester. First-Year Katherine Coble is a staff writer. Her email is kcoble@fandm.edu.